The Mission of Corey’s Network, Inc. (CNI) is to provide immediate support, advocacy and services to surviving victims of homicide in the Kansas City metropolitan precincts without advocates. Advocacy in this case means connecting victims to counseling, educating them in reference to the investigative process, help with navigating the media, and help with funding the funeral when necessary. After researching local funeral homes, we have found some will not pick up the remains of a homicide victim until the funeral is paid in full. In Jackson County, MO it is their practice to wait for a limited time, then when that period of time has elapsed, they ask the family to cremate the body of the homicide victim. This not only violates the surviving victims a second time, but in some cases it is against their religious beliefs for the body to be cremated. In other cases, the prosecution of a case could be strengthened by exhuming the body, and cremation would make this impossible. Corey’s Network, Inc. believes every homicide victim deserves the honor and respect of a dignified funeral. The intention of CNI is to assist surviving victims of homicide with the outstanding expenses incurred as a result of this crime. In doing so we are seeking partnership with local funeral homes. Additionally, CNI will strive to assist families once all other sources or benefits have been exhausted. For example, if a family files for assistance from the Crime Victims’ Compensation Program and the claim is found to be eligible, they will pay up to $5,000. If the cost of the funeral exceeds this amount, CNI will strive assist with paying the remaining balance. 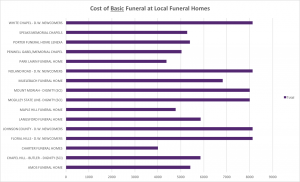 Here are the results of a price survey conducted by collecting the General Price Lists of the funeral homes listed below. 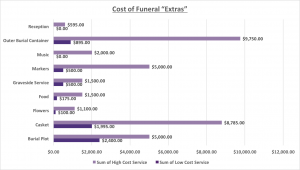 You’ll find the traditional funeral service prices for some larger funeral homes in the Kansas City area. When you look into the costs of a reception, burial container, music, marker (headstone), graveside service, food, flowers, casket, and the burial plot those items add between $6565.00 and $35,232.00 more. Individuals without insurance cannot cover these costs alone. Crime Victims Compensation will reimburse a family $5,000 once a funeral has been paid for (and if the family meets their criteria). However, as you can see, this amount will not meet the needs of those that have already suffered from a devastating loss of a loved one. We need your help! !